Chapel Hill Retreat proved again a perfect location for a wedding ceremony. Chapel Hill Retreat once again proved a brilliant location for a wedding ceremony. 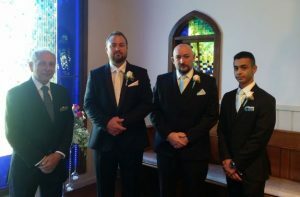 On this occasion the ceremony took place within the beautiful old chapel only 50 metres from the reception centre with about 50 guests attending. With the arrival music (processional) provided by DJ:Plus! Entertainment, the ceremony was one of the most beautiful I have had the pleasure of performing. The couple had a fascinating love story behind them which I was able to weave into the ceremony. There is no doubt that this phenomenal location, just West of Bilpin in the Blue Mountains, provides the perfect setting for a memorable wedding ceremony. This is not the first time I have conducted a wedding at Chapel Hill, the last one being coordinated by Emily Jean Events. I look forward to my next wedding at Chapel Hill Retreat, that being a SSM couple booked for next year.